This dinner, organized and hosted by the Wine Workshop, showcased a number of gems from Piemonte’s celebrated 1978 vintage paired with the cuisine of Eleven Madison Park and Executive Chef Daniel Humm. For more insight on the inspiration behind this utterly sublime menu, readers should take a look at my video interview with Humm here. I will confess I spent most of my attention focusing on the wines, but the food was out of this world. Winelovers know 1978 is one of the all-time great Piemonte vintages. I will go so far as to say it is the greatest vintage, as so many wines – and certainly all of the greats – are still going strong. Cold weather during the flowering lowered yields dramatically in an era in which green harvesting didn’t exist. Perfect weather during the fall brought the small crop to ripeness during a late harvest that will always be remembered for having produced some of the most monumental wines on the planet. As with any tasting or dinner of older wines, provenance and bottle variation is always a concern. For the most part, these wines showed about as well as anyone could have realistically hoped. Most importantly, all of the big guns delivered the goods and showed why they remain so highly sought after. At the same time, it was a great deal of fun to rediscover a number of forgotten bottles that over delivered. Among the early highlights of the evening, Ceretto’s 1978 Barbaresco Bricco Asili, showed all of the qualities of the year as expressed through the Asili vineyard, one of the finest in all of Piemonte. At the time, Ceretto was still a traditional producer, and 1978 remains one of the estate’s all-time great vintages. The 1978 was made from a parcel planted in 1971, and just one 25 hectoliter cask was produced. Cordero di Montezemolo’s 1978 Barolo Monfalletto was also quite pretty, as it has been for some time. The delicate, floral side of La Morra came through nicely. Interestingly, by 1978 Paolo Cordero di Montezemolo was already experimenting with shorter fermentations of around 10-12 days, which was quite a bit less than the 30 days or more that was the custom back then. Gaja’s 1978 Barbaresco has always been a bit of a brute. On this night it was less impressive than on other occasions, but I attribute that to simple bottle variation. The 1978 was aged 80% in cask for 30 months, while the remaining 20% was aged 8 months in French oak and spent the remaining 22 months in cask. Oddero’s 1978 Barolo was the unquestioned surprise in our second flight. Oddero is one of Piemonte’s most historic estates. In the late 1970s, Oddero was also one of the top estates in the region. Sadly, though, the recent track record has been more spotty. In the late 1970s, Oddero made just one Barolo in the classic tradition, which is to say a blend from various sites. Most of the fruit was from La Morra (Bricco Chiesa and Brunate), Villero and Rocche di Castiglione. 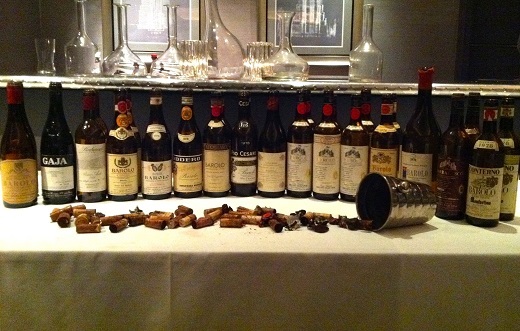 Of all the wines in this tasting, Oddero’s 1978 Barolo is the one wine I wish I had tasted more often. It was truly eye opening. A wine of exceptional balance and class, the 1978 was a pure pleasure to taste. Aldo Conterno’s 1978 Barolo Bussia Soprana was also terrific. For a wine considered ‘entry-level’ it was fabulous. I have always believed top-level producers tend to do well even with their less prestigious wines, and this was a great example. The 1978 Bussia Soprana can still be cellared, but I don’t see too much upside from here. The 1978 Barolo Riserva from Terre del Barolo was awkward and ungainly in this elite company. Teobaldo Cappellano’s 1978 Barolo was one of my favorite under the radar wines until he became well-known in this country a few years ago. A dark, mysterious wine, the 1978 was all iron, smoke, tar and black fruit. In other words, a classic expression of Serralunga and the Parafada vineyard. I was thrilled to see the 1978 Cappellano in the line-up, since it was a last minute addition from one of the attendees. Needless to say, this incredible gesture of generosity was deeply appreciated by all, and was a great example of the camaraderie the world’s best wines inspire. Thank you! The 1978 Barolo Villero from Giuseppe Mascarellowas also terrific. In the late 1970s Mascarello bought fruit from Villero. Today he owns a parcel, but in a different spot within this large Barolo cru. In my view, the fruit Mascarello was buying in the 1970s gave more structured, powerful wines, and the 1978 is a perfect example of that. Pio Cesare’s 1978 Barolo was another surprise for a number of reasons. Unbeknownst to me, proprietor Pio Boffa decided to attend the dinner. Boffa added invaluable first hand commentary on the region and a number of the wines. His 1978 Barolo showed beautifully, as I thought it would, based on my previous tastings. Pio Cesare’s Barolo is another wine made from multiple vineyards, an approach that today is sadly pretty much non-existent. Barolo fans have long known about Rocche dei Manzoni’s 1978 Barolo Valentino Riserva, one of the favorite, cultish wines of the year. Widely acknowledged as the first Barolo aged in French oak – about 50% in this vintage – the 1978 has always been viewed as a wine that opened the door for the modern style that would increasingly gain traction in the 1980s and 1990s. Made from the estate’s Vigna d’la Roul vineyard, the 1978 Riserva remains youthful, vibrant and full of life. These three 1978s from Bruno Giacosa were all lovely. None are considered among his very best work by thecognoscenti, so they remain somewhat under the radar, but they are jewels just the same. The 1978 Barolo Villero (white label) was finest of the three wines in this flight. Although not up to the level of the 1978 red label Villero, the white label was a fine poor-man’s substitute, with plenty of vineyard and vintage character, and that inimitable Giacosa perfume. 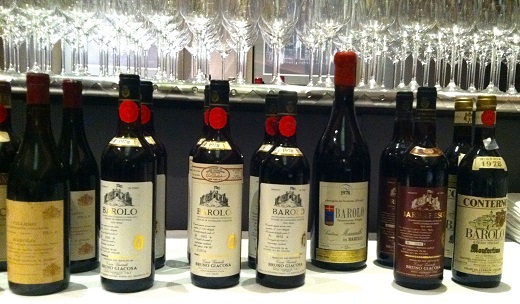 I was most intrigued by the 1978 Barolo Arione, a wine I had only tasted once before. Arione lies next to Cascina Francia, but has a cooler microclimate. Intense iron and crushed rock notes dominated over fruit in this mid-weight Barolo. The 1978 Barolo Pugnane was pretty, if a touch frail. Like the Arione, any remaining bottles should be drunk up, unless they are sitting in a cold cellar and have never been moved since release. All night anticipation had been building for the final flight. The wines delivered the goods. And then some.Bartolo Mascarello’s 1978 Barolo (from 1.5 liter magnum) is a highly inconsistent wine because many of the surviving bottles and 1.5 liter magnums that are still in the market were not bottled at the estate, but were bottled from larger 1.9 liter magnums by the original purchasers of the wine, a practice that was not unusual at the time. Thankfully, this magnum was firing on all cylinders. With age, Bartolo Mascarello’s wines become quite delicate and Burgundian, but the 1978 still has plenty of power and structure. The vineyard sites were the same as today, Rocche dell’Annunziata, Cannubi, Rue and Cannubi/San Lorenzo, all vinified together in cement and bottled after four years. Giacosa’s 1978 Barbaresco Riserva Santo Stefano is rightly considered one of the iconic wines of the year. On this night it was monumental. A veritable kaleidoscope of aromas and flavors delighted everyone in the room as this structured, intense Barbaresco showed off its pedigree. Giacomo Conterno’s 1978 Barolo Monfortino followed and it was just as great. Still virile, powerful and imposing, the 1978 Monfortino captivated all the senses with its unique and inimitable personality. Giovanni Conterno produced an instant masterpiece with his 1978 Monfortino, the first Monfortino made from the family’s Cascina Francia vineyard, purchased and planted just four years prior. I can’t think of a better set of wines to conclude this fabulous evening!